On this, the 100th anniversary of Ronald Reagan, we discovered this very illuminating video from renown economist and research professor Michael Hudson, which explains some of the unique aspects of "Reaganomics" and what it actually did to the American economy. PAUL JAY, SENIOR EDITOR, TRNN: Welcome to The Real News Network. I'm Paul Jay in Washington. February 6 will be the 100th anniversary of the birth of Ronald Reagan. It will be celebrated by meetings and symposiums all over the world. Now joining us to give his take on Reaganomics is Michael Hudson. Michael's a former Wall Street economist, a distinguished research professor at the University of Missouri-Kansas City, and he runs a website: Michael-Hudson.com. Thanks for joining us, Michael. MICHAEL HUDSON, RESEARCH PROF., UMKC: Thank you very much. JAY: We are celebrating the successes and achievements of Ronald Reagan in, particularly, economics. What do you make of Reaganomics? HUDSON: Well, obviously, it--a consequence was to quadruple the federal debt by cutting taxes. Most people think of him in terms of lowering income taxes, especially on the higher brackets. But one of the key things that people don't recognize is what he did with the small print of the tax code, especially in the 1981 tax revision as it affected real estate. He gave real estate double declining-balance, so that you could depreciate a building as if the building was wearing out, even as the property were gaining price, doubling, quadrupling, as if it were wearing out, and avoid paying any income tax at all. Not only did our real estate owners--absentee owners, that is--avoid paying income tax, but they had a tax loss carry forward while their building was soaring in price, while their rents were rising, while they were making more and more money. The tax code enabled them to pretend that the building was wearing out in just seven and a half years. And this was at a time when the most expensive buildings were prewar buildings, even hundred-year-old buildings, when buildings were built better. And so what Reagan did was make the FIRE sector--finance, insurance, and real estate--virtually tax-exempt. So it wasn't that he lowered income taxes; he abolished them. He replaced the regulatory commissions with deregulators, especially the group that was called "the crazies" out of Utah, who were put in charge of the Environmental Protection Agency and other environment agencies. JAY: But the supporters of Reagan say--they may even agree with much of what you just said. They said, well, this allowed growth in the economy, it gave rise to prosperity, regulations out of the way, lowering, even elimination of taxes. I mean, a lot of his supporters would applaud all of that and say it was a positive for the economy as a whole. HUDSON: When people talk about the economy, what do they mean? When Reagan took office in 1979, the wealthiest 1 percent of Americans got 29 percent of the revenue accruing to wealth. Interest, dividends, rent, and capital gains. By 2004 they'd doubled that proportion to 59 percent of the returns to wealth. So the economic growth did not accrue to labor. Labor's living standards and real wages have not increased since 1979. During all of Reagan and Bush and Clinton, their living standards didn't go up. So the economic growth was all in the overhead of the financial sector. It was all rentier growth. JAY: Okay, but the theory is it's supposed to trickle down. So didn't it? HUDSON: No. There was--it was sucked up. That's the important thing. Instead of trickling down, there was a huge sucking up of wealth to the top. If it trickled down, the richest 1 percent wouldn't have doubled their share of the returns to wealth. 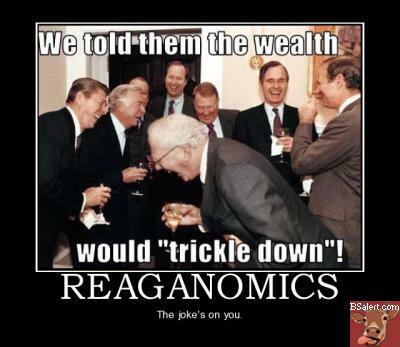 If it had trickled down, real wages would have gone up. Instead, we have the greatest inequality of any country in the Western world. 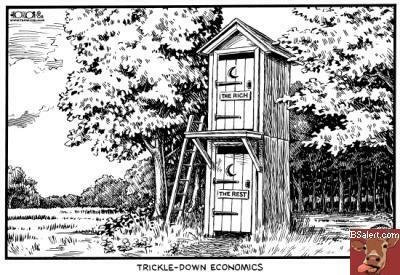 That's not trickling down. JAY: Part of Reaganomics was the relationship to foreign debt and what happened with interest rates. That was also why it wasn't very good for Brazils and other places. It did draw a lot of money back into the US. Wasn't that good for the US economy? HUDSON: No, because it would have been good for the economy if the money coming back to the United States would have been invested in real, tangible capital formation. But it wasn't. The money coming into the United States took the form of loans by the upper 10 percent of the population to the bottom 90 percent. So the wealth coming back in ended up indebting the bottom 90 percent. The bottom 90 percent had to go into a lifetime of debt peonage in order to afford housing. There was a huge increase in housing prices. The advocates of Reaganomics said, look, he created balance sheet wealth; look at how everybody got rich off their houses. But when you say someone got rich off the value of their houses, that means new buyers have to pay much, much more of their future income to afford housing. So what they call wealth creation is actually debt creation that impoverished the economy, laying the groundwork for the bubble economy that burst under Bush and Obama. JAY: Now, at the end of Reagan's presidency, what was the state of the union? What the narrative is: Reagan was one of the great economic presidents of our time. HUDSON: Including the other four years of Bush, the Reagan Bush. The effect was to quadruple America's debt. Reagan crippled the country economically. That was the objective. His backers were predators. Making an economy free for predators is not what the classical economists meant by a free market. Adam Smith talked about businessmen getting together to establish a monopoly over the economy. Adam Smith would have turned over in his grave to say the Reagan idea of free markets is to open the markets to crooks, to fraudsters, to environmental degradation, to predators, to creditors. JAY: So how does Reagan emerge, then, as one of the great heroes of modern presidency, and particularly of free-market, small-government success story? HUDSON: Well, if you're a predator and a wealthy Wall Street investor and you control the media, you would want to applaud him too. Remember, the people who are applauding Reagan are the people who applaud Mikhail Khodorkovsky in Russia as a freedom fighter when he was the biggest embezzler in Russia. These are the people who applaud criminals. For them, the criminals are economic success stories, not criminals. So if you want to call crime an economic success, then of course you're going to applaud Reagan, rightly so. JAY: Sarah Palin--[former] governor Sarah Palin's going to be speaking at one of the events celebrating Reagan's birth. What do you make of the way that the Tea Party adopts Reagan, I guess, as one of their ideological gods? HUDSON: I would say that the Tea Party has an agenda that is subsidized by very wealthy people whose objective is to distract the members of the Tea Party from how the economy actually works and to turn their frustration against each other, and especially against higher-paid labor. I remember once I was driving with Herman Kahn over to visit Governor Rockefeller. And we were in the car, being driven by Rockefeller's chauffeur, and Herman turned to me and said, you know, Governor Rockefeller's chauffeur is not jealous of Governor Rockefeller; he's jealous of the other chauffeurs for the Harrimans and the people who live near the estate who get paid more. That's the Tea Party strategy: get labor jealous of public sector labor who might pay more, jealous of people who've been evicted but somehow are able to keep their houses. You turn the fighting within, rather than against the people who are actually fighting them. This is class war 101. HUDSON: Thank you very much.